The set of the Monique Lhuillier autumn/winter 2014 show was strikingly simple: a ruin-like structure positioned at the entrance of the runway, evoking past times of architectural splendour. As pulsating sounds filled the Mercedes-Benz theatre with haunting, dark mystery, 42 provocative creations appeared on the runway. Brilliant noirs were predominant among the gold, white, slate, bronze, blush colours of the chosen palette; dramatic midnights softened by pops of fuchsia punctuated the flow of sheer elegance. Building on the idea of fusion between structure and fluidity that is at the heart of this season’s collection, the designer was able to create a contemporary look by bringing together glistening cobwebs of cotton lace and vinyl, futuristic neoprene and geometric guipure lace, confetti florals, elegant embroidery and techno leather, soft tulle and surprising complements of abstract skeletal embroidery and by using patent leather belts that firmly wrap around sleek silhouettes. The stunningly beautiful garments came in a variety of lengths and angled hemlines “from stirring minis, to coy high-lows and brushing trains for a glimpse of secret within”. The shoe collection included sheer lace booties, delicate tall shaft lace boots offset with patent leather, brushed suede and hardware, asymmetrical graphic mules and crystal encrusted sandals. A noir silk taffeta cape with fuchsia baroque embroidery flowing over a noir strapless mesh high-low gown ended the show as it disappeared behind the set, leaving the air filled with awe and beauty. 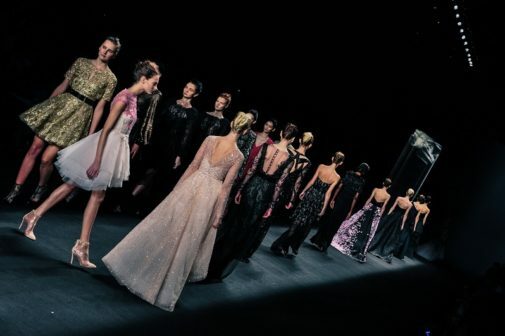 To watch the video of Monique Lhuillier’s A/W 2014 collection visit here. To see all of Monique Lhuillier’s collections and creations, visit her website.